Our Impreza's spongy brakes were driving us nuts ever since we bought it. The pedal was very soft through about the first third of its motion, and then worked as normal. Pumping it several times (or left-foot braking like a boss while flying sideways through a rallycross course) improved the feel briefly, only to be soft again after a bit of normal driving. Conventional wisdom told us it was air in the system, so we bled it thoroughly with some fresh fluid. The old fluid was more black than the windscreen wipers on the MCM Pulsar and a couple of the bleeders were seized hinting at the importance the previous owner placed on bleeding his brakes, but that's another story. Bleeding the brakes did absolutely nothing. A marginal improvement maybe, but still by far and away the worst feeling brakes of any car I've ever driven. Digging through the interweb on Subaru-specific brake softness led to several threads unanimously agreeing that the only cure is to bleed the brakes. So we bled them again. And a third time, just to be sure. Same soft pedal. More digging led to some brake gurus who claimed that there were bubbles trapped in the maze of tubes and valves that is the ABS pump, and that to really get all the air out of an ABS-equipped car you need to trigger the ABS a few times, and to bleed the brakes again. So we did. Nothing. Same soft pedal. Then, after almost giving up on our brakes entirely, we've discovered the cause. A seized piston in one of the brake calipers! See, GD/GG Imprezas had two-pot calipers on sliders in the front, kind of like one side of the 4-pot WRX caliper. 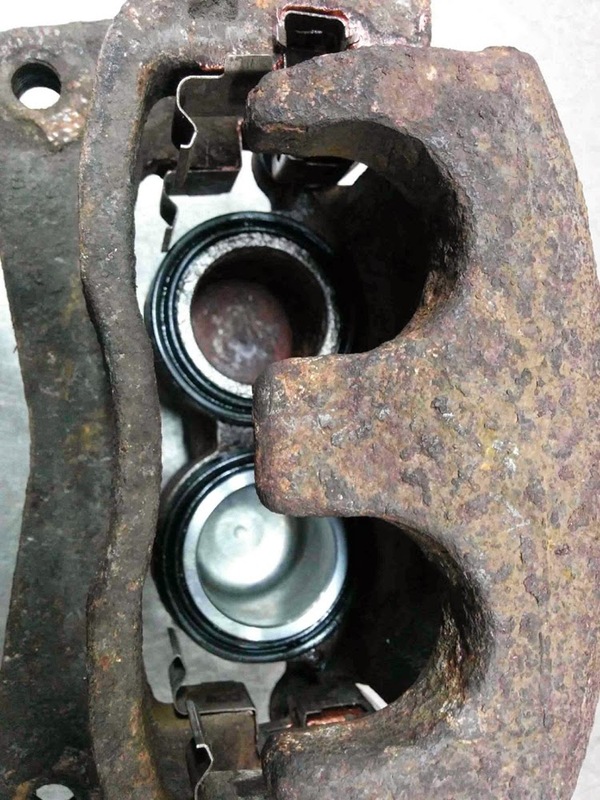 When one piston seized, it meant that it no longer retracted and held the pad up against the rotor, while the other piston did retract like it should. That meant it took some pedal motion for the non-seized piston to reach the pad, leading to the softness. So, calipers rebuilt and piston replaced, we finally have normal feeling brakes. That is, they're slightly worse than average, which is a million times better than what we've started with.